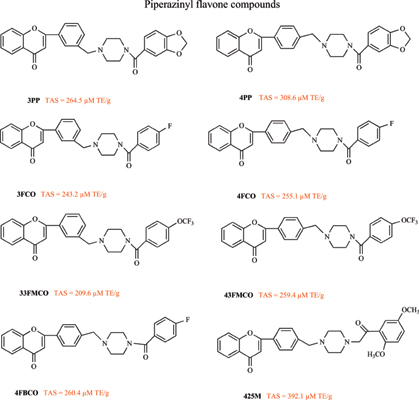 Background: A new series of 13 piperazinyl flavone derivatives has been synthesized and examined for their in vitro antiradical and antioxidant activities in response to the pharmacy industry’s increasing demand for new non-toxic anti-inflammatory and anticancer drugs. Method: Their antioxidant activity was evaluated by the reactive oxygen species (ROS) scavenging assays, 2,2-diphenyl-1-picrylhydrazyl free radical (DPPH•) and 2,2'-azino-bis(3- ethylbenzothiazoline-6-sulphonic acid) radical cation (ABTS+•) scavenging assays, and the ferric reducing antioxidant potency (TAC) method, and was compared to known positive controls, herbal infusions, and penicillins. Chemiluminescence, spectrophotometry, electron spin resonance (ESR) and 5,5-dimethyl-1-pyrroline-1-oxide (DMPO) as the spin trap were the measurement techniques. Result: It was seen that synthesized compounds have a wide spectrum of antioxidant property. Some of the test compounds proved to be extremely efficient scavengers of H2O2 exhibiting, in some cases, EC50 of about 2 µM. The values of antioxidant status (TAS) were in the range of 49 ± 3.9 to 1283 ± 51.3 µM TE/g (TE = Trolox equivalent) and were lower than that of butylated hydroxytoluene (BHT) (1304 ± 43.2 µM TE/g) and green tea (1356 ± 40.0 µM TE/g), but for several synthesized compounds, they were higher than chamomille infusion and penicillins. Ferric reducing antioxidant powers (TAC) for the piperazinyl flavone derivatives were in the range 7 ± 0.5 to 104 ± 0.6 µM TE/g and were weaker than that of BHT (217 ± 5.3 µM TR/g ). Conclusion: Carboxylic or hydroxamic acid substituted piperazinyl flavones are potentially active as antioxidants, thus may be suggested as pharmacologically interesting ones. Anticancer drugs, antioxidant activity, chemiluminescence, electron spin resonance, free radicals, piperazinyl flavones derivatives.